Can Pistachios Burn Fat and Calories? Pistachios are related to mangoes, and have been part of the human diet for 9,000 years. They were made popular in 1940s America through the introduction of pistachio ice cream by Philadelphia’s James W. Parkinson. Pistachios used to be dyed bright red by manufacturers to make them more visible in vending machines, so eating pistachio nuts was a messy adventure. Pistachios are heart-healthy and high in nutrients, but there are no such things as magical fat-burning foods. If you are trying to lose weight, it makes sense to eat pistachio nuts as part of a healthy diet, not in place of one. Pistachios contain high levels of vitamin B6, potassium, magnesium and phosphorous. A 1-oz. serving, or about 50 pistachios, contains 170 calories and as much fiber as a small bowl of oatmeal. According to professor of nutrition Dr. Penny Kris-Etherton, at Pennsylvania State College, eating a total of 3 oz. of pistachios per day as part of a heart-healthy diet can decrease your risk of cardiovascular disease. So, while pistachios may help regulate cholesterol levels, that does not mean they burn fat or calories. Not all fat is the same. Saturated fats like those found in animal products can contribute to high levels of LDLs, or low-density lipoproteins, or bad cholesterol. According to a study done at Pennsylvania State University and reported on at the Experimental Biology meeting on April 30, 2007 in Washington, D.C., subjects who ate typical American diet plus 3 oz. of pistachios per day showed lower levels of LDLs and higher levels of HDL, or high-density proteins, or good cholesterol. Nuts are loaded with omega-3 fatty acids, which support heart health. The high fiber content of pistachios will not only help you feel full for a longer time than empty calories would, but the fiber is essential for healthy elimination. 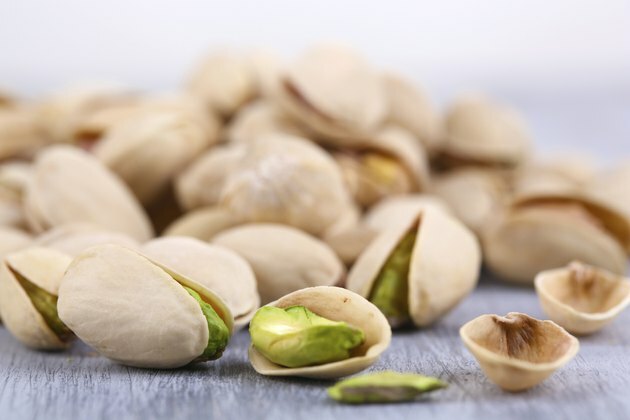 A snack of pistachios and fruit is healthier in every way than a snack of chips, fast food fries, or anything bright orange that comes in a box or a bag. Pistachios have many healthy qualities, but they do contain calories. Choosing salted varieties may raise your sodium intake to unhealthy levels. No food, not even one high in good nutrition, can take the place of a well-balanced diet and an active lifestyle.